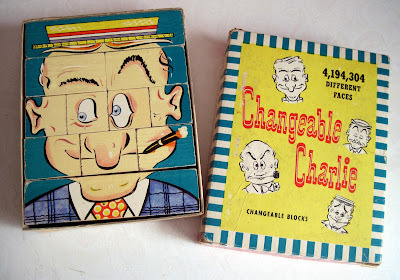 One of my favorite vintage toys is Changeable Charlie, a classic American toy made from the 1940s through the 1960s. Charlie is a man of many personalities: colorful printed features applied to the sides of multiple wooden blocks can be flipped and repositioned, creating lots of characters. "It's a mathematical fact that you can play with 'Changeable Charlie' eight hours a day, five days a week, fifty-two weeks a year, making one change a minute, and not repeat yourself in over thirty-three years! If you want to know how mathematicians figured this out, send us a postal card with your name and address. We'll be delighted to show you how it's done." Alas, I have to go to work each day, and so have been unable to test this claim. This 1948 set features fantastic caricatures. 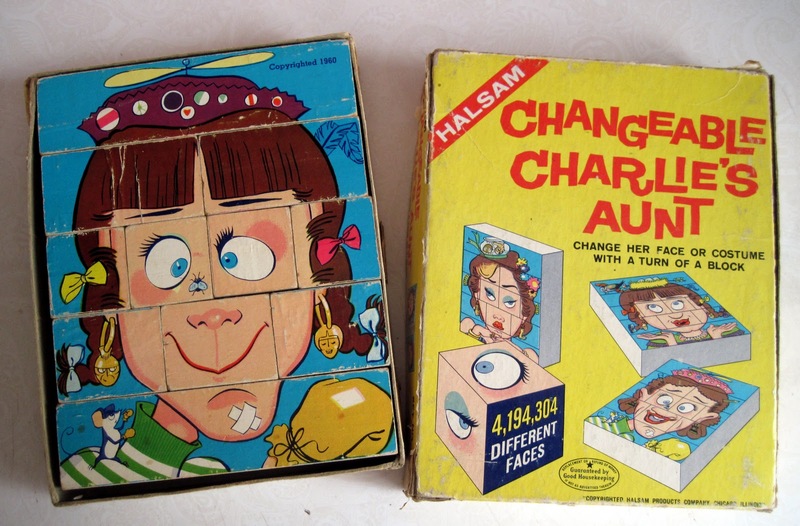 Changeable Charlie was so popular, it spawned a sequel called Changeable Charlie's Aunt. This set dates from 1960. I really would like to have when I was a little girl. I still have mine. My kids played with it now my grandkids are enjoying it. glad that I kept it. Great post! 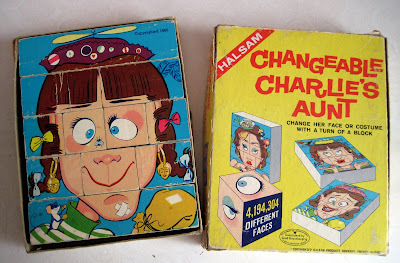 I Love Changeable Charlie!!! 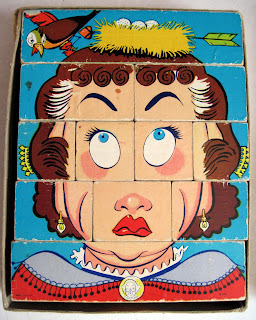 It was a favorite childhood toy. 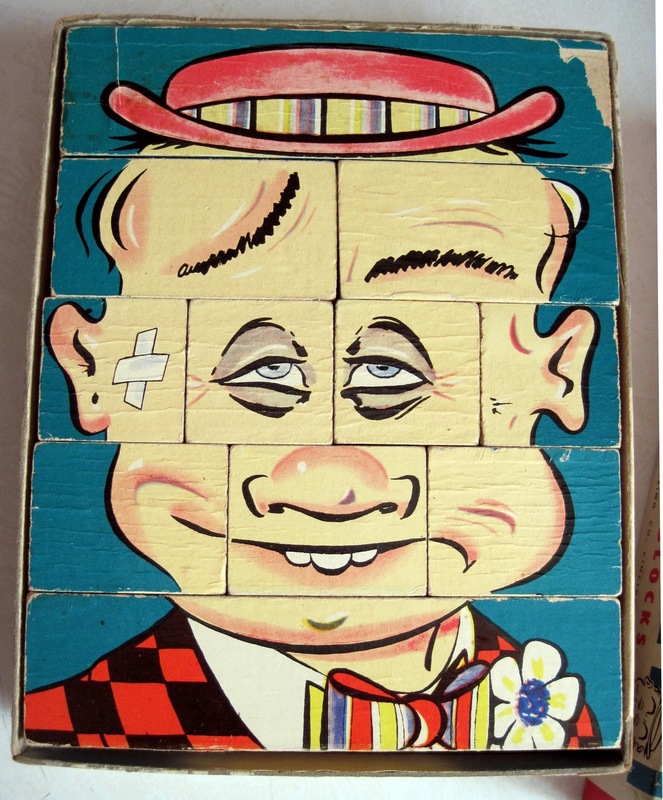 I bought several (including Charlie's Aunt) on eBay quite a long time ago!! Had one as a kid and still remember liking it. Age now 73, go figure.